The prime crew of the first manned Apollo space mission, Apollo 7, participates in water egress training in the Gulf of Mexico. 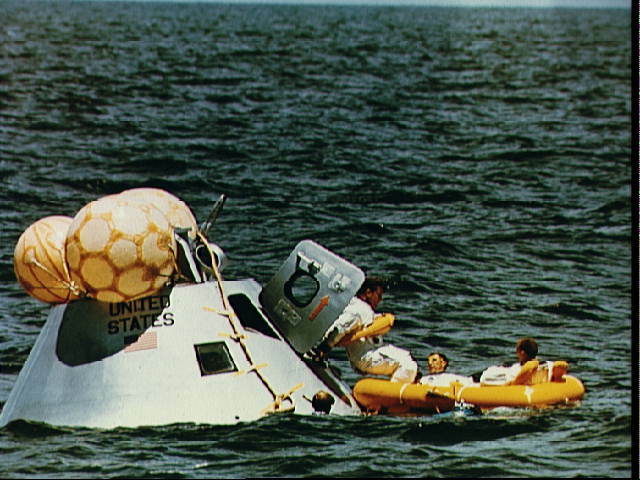 Left to right, are Astronauts Walter M. Schirra Jr. (stepping into life raft); Donn F. Eisele, and Walter Cunningham. They have just egressed the Apollo Command Module Boilerplate 1102, and are awaiting helicopter pickup. Inflated bags were used to upright the boilerplate. Manned Spaceflight Center swimmers assisted in the training exercise.